This week Jo Zebedee takes a break from alien invasions of Belfast to bring us to the Glens of Antrim. I’m not from the Glens of Antrim, but I’m not far away. Around 5 miles from my house, there is a small glen (Gleno), with a waterfall and a magical wild-swimming pool. The Antrim Coast Road begins, properly, about 10 miles up the road from me. I’ve been up and down that road, and in and out of the glens, all my life. And yet, even to one familiar to them, they are still a place that feels different. Magical, almost. One of my family’s favourite places to visit – even the jaded teens! 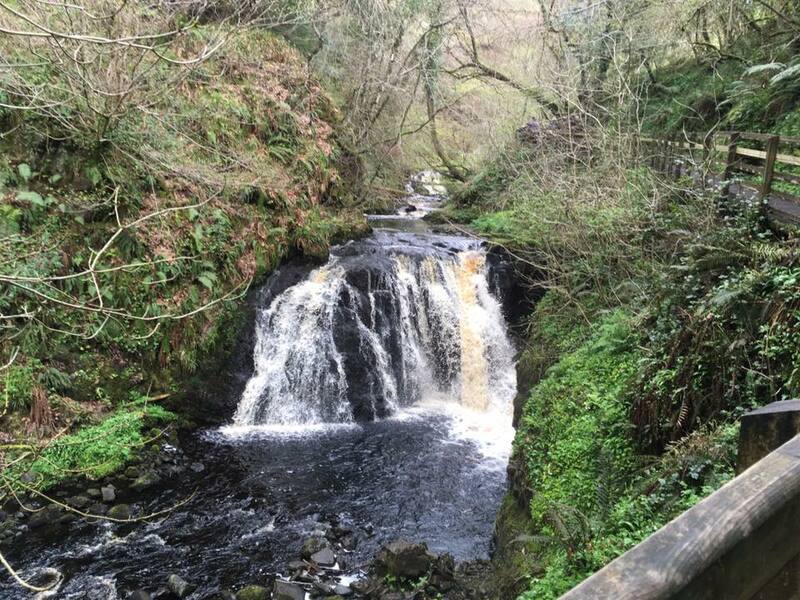 – is Glenariff, with its waterfalls and fairy-land walkways. There’s an enchantment about the place, a slowness that makes it feel cut-off. That aspect of the Glens is the version shown on Tourist leaflets and fridge magnets. Indeed, there are often tour coaches in attendance, and American voices mingle with the Northern Irish tones. What, perhaps, is not so well known is the harsher landscape of the Glens, the mountains through which the fairy-like valleys cut. That land is harsh and rocky. As much as the Coast Road is pounded by the Atlantic on one side, it was pounded out of the land that flanks the other. It’s not hard to see why I was inspired to set Waters and the Wild, a complex tale of mental illness set against a rich fantasy backdrop, in the Glens. 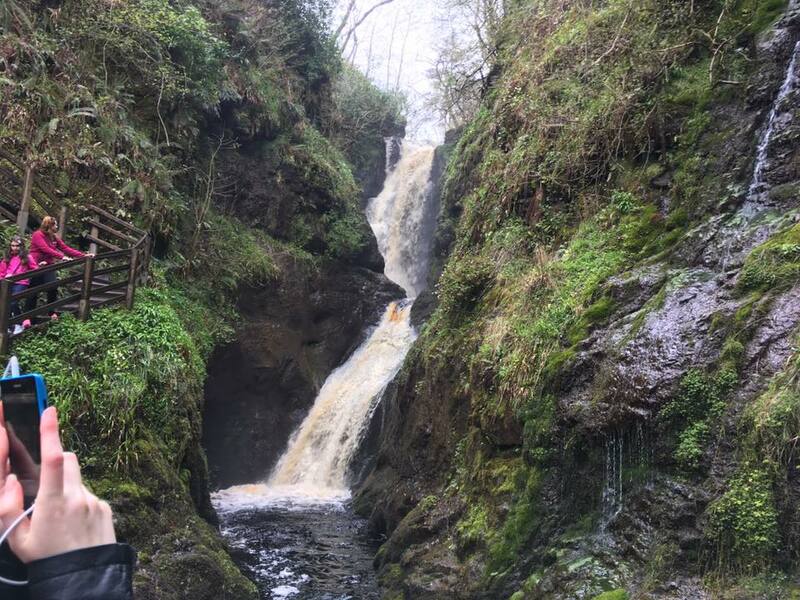 Whilst I show the gentle side of the Glens – my opening scene is set at the waterfall at Glenariff – some of the key scenes are set in the harsher areas. The sea, sometimes. But, also, on the bleak hills. And one of the places in that landscape called to me, like few places ever had. 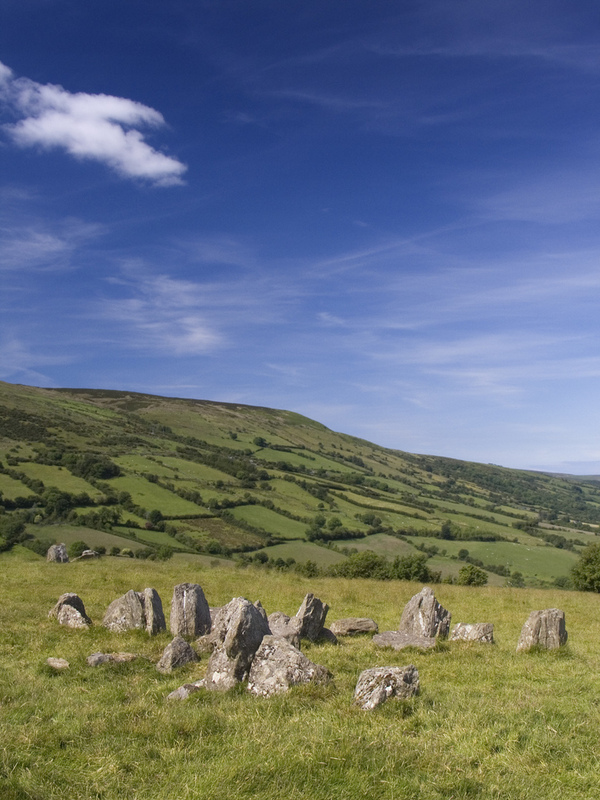 It’s a place – set in a field, really – called Ossian’s Grave, near Cushendall. It’s not the easiest place to find. It’s off a road, past a farm, complete with barking dog, and up a long hill. I spent a week on holiday across the road from the site and didn’t make it up until the last day. Finally I decided to embrace my inner hill-walker (never that keen to put her boots on, to be honest) and started to climb. The lane was narrow, and steep, but not difficult. It cleaved to the right and then there was a stile and a green sign marking a bare field, that looked over a glen to another hill beyond. In that bare field is Ossian’s Grave. Ossian – or Oisin, as commonly known – was a Celtic mythological hero, who was taken from this world to dwell in Tir-na-Nog and have eternal life. But Ossian, we are told, grew to miss the Glens and he asked to return to see their beauty again. To do so, he was warned not to come off his horse; to set foot on the land would kill him. His horse stumbled, Ossian fell to the ground, and there he withered and died. There are a several Ossian’s/Oisin’s Graves throughout Ireland, and indeed Scotland, but this one over Cushendall is more than just a mythological site. The grave itself is a megalithic court cairn, scattered across the field. Its grey stones are fixed to the Earth, tall sentinels of a lost past. And then, to make sure everyone knows they are in a special place, to one side of the field a small cairn can be seen, with a rowan growing from it. Go closer, and a plaque catches what light there might be. 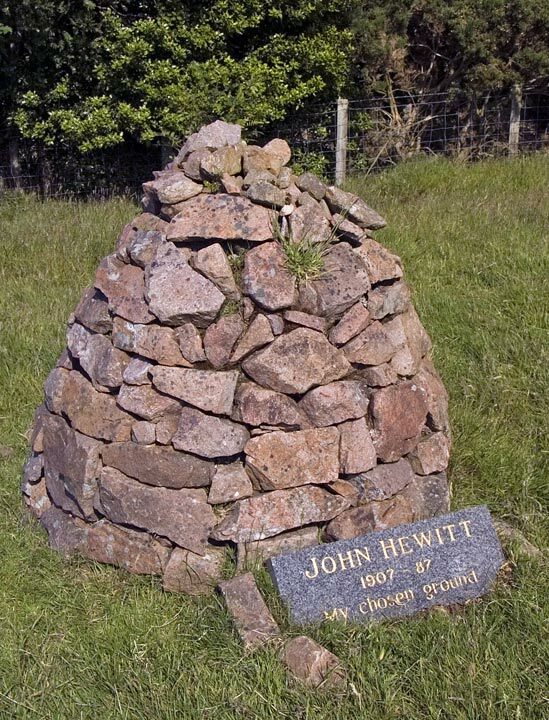 This is in remembrance to John Hewitt, known as the ‘poet of the Glens’, a voice for the people of the North. It is, the plaque announces, ‘his chosen ground’. It came to me that this place was somewhere thrice-touched by magic. The cairn, the hero, the poet, all in one place. As the wind raked the grass and the world carried on at the bottom of the hill, it was clear that to know the Glens of Antrim requires a person to move beyond the fairy glens, onto the rugged mountains. The mountains give a sense of the land and its people and that’s captured, as well as anywhere I know, at Ossian’s Grave. It’s why I had to write about it – and why, I’m sure, the Glens and their bewitching land, will appear in more of my writing. It might even be about the dicotomy that is Northern Ireland – the harsh appearance and accents, the softer lands and warm welcome, the confusion and complexity that is this place. That magical combination of peace and history, of bleakness and poetry, might well be the very essence of my homeland to me. 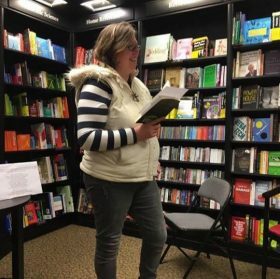 Jo writes science fiction and fantasy, mostly based in her native Northern Ireland. Best known for Inish Carraig, where she destroyed most of Belfast in an alien invasion, she’s currently working on the sequel, in which she turns her attention to the rest of the country. When not writing, Jo is a management consultant.